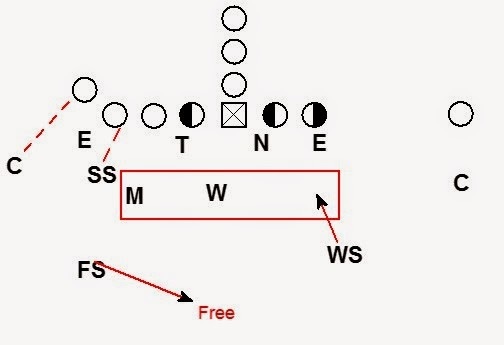 This is the first article in a series about Cover 1 or man free coverage from the 4-2-5 defensive alignment. Against two Back formations the defense will use a funnel technique of two linebackers and one safety vs. the two running backs. 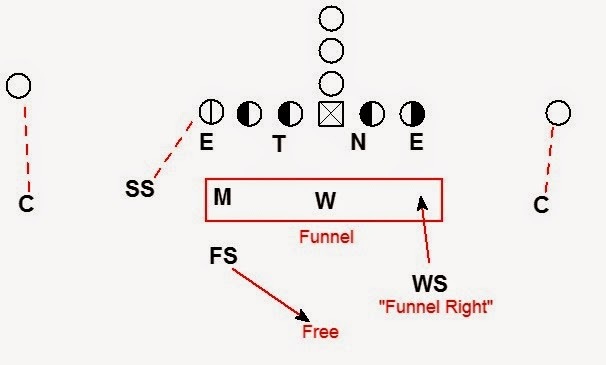 Funnel is the name of a 3 on 2 man coverage technique. 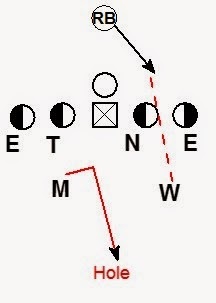 Against a pro formation the corners handle the #1 receiver to their side. The SS mans up #2 strong. The safety who is going into the funnel makes a funnel and direction call. The linebackers bump their alignment away from the funnel call. 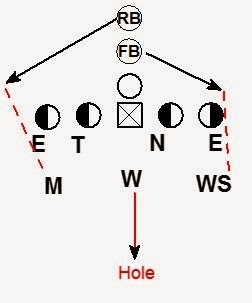 In the example above the WS makes the "funnel right" call which bumps the linebackers to the left. 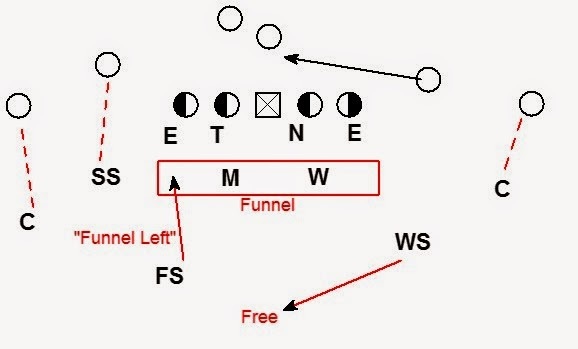 Against a two back formation into the boundary the WS will handle the #2 receiver and the SS will be in the funnel. 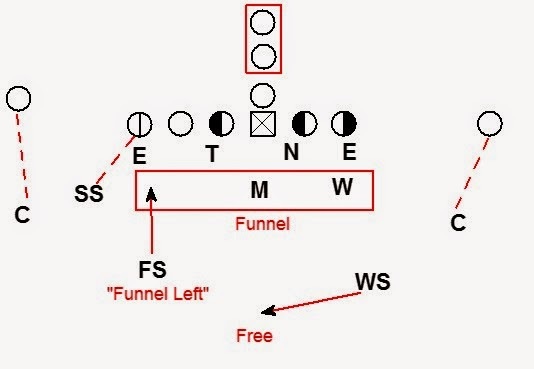 We also have the ability by game plan to use the FS in the funnel against two back formations. Based on where the offense is running the ball will determine which safety we choose to use in the funnel. Also where offenses are releasing backs into routes will effect which safety we will use. We always prefer for a safety to handle man coverage responsibility if possible. Other factors also determine where we are planning to invert the safety. For example a wing formation. 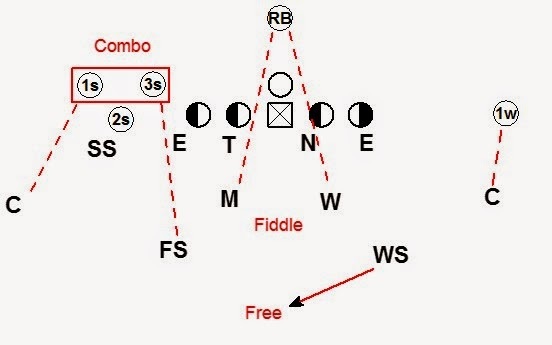 The wing formation can create a jam packed alignment for the Mike and the SS. It can be easier to have the FS invert against a wing. Dropping the FS into the box from depth allows the SS and Mike to align without stepping all over one another. 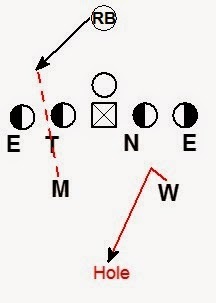 Another example is against weak side run. Our weak safety may not be a good matchup vs. a fullback on weak side runs. Having the Will block shedding a fullback is typically the better matchup. The funnel technique is simple. We have 3 defenders for 2 running backs. The funnel player not manned up becomes a zone player dropping to the Hole. The hole is 10 yard deep over the center. The hole player will cover any route crossing his face. Here the running backs split. The Mike man covers the 1st back to his side. The WS handles the first back to his side. The Will becomes the hole dropper. When both backs release to one side the outside of the funnel (here the WS) will take the first back. The middle of the funnel (here the Will) mans up the 2nd running back. The Mike has no back to man cover and drops to the Hole. When both backs release to the other side the WS ends up with no back to man cover and drops to the hole. 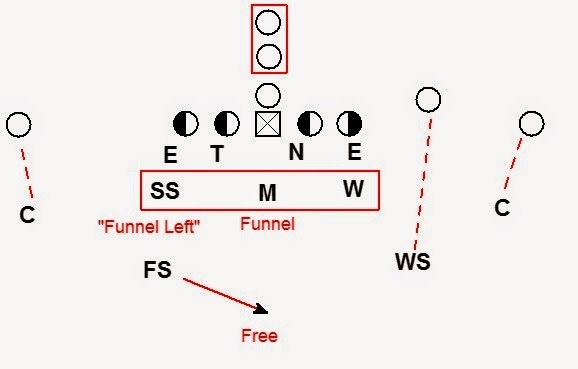 When the offense aligns in spread formations with only one back there is no need for a funnel technique. Against a one back set we use a Fiddle technique. Fiddle is the name of our 2 on 1 technique. Against a 2x2 formation the Corners man #1 to their side. The SS and WS handle the #2's leaving the FS free. The linebackers have a 2 on 1 (Fiddle) against the running back. Fiddle technique is very similar to funnel. 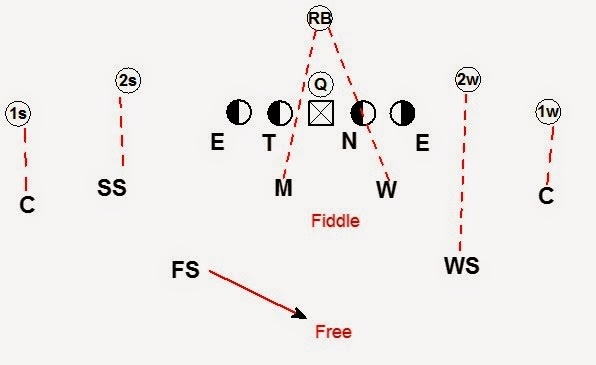 The fiddle linebacker to the side of the running back's release has him man to man. The linebacker opposite the back drops to the hole. Against 3x1 the FS will handle #3 and the WS will be free. 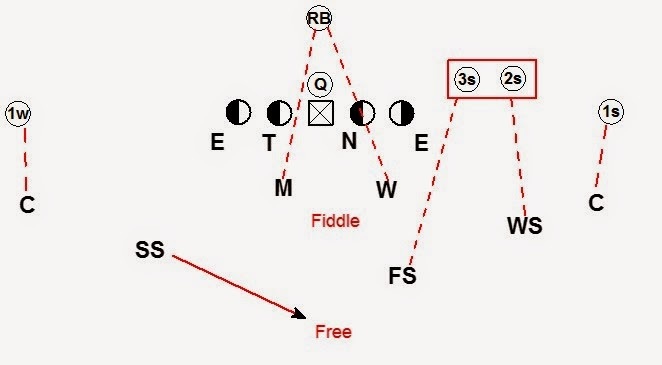 Against spread teams we often play combo coverage on #2 & #3. By playing outside alignment on the #2 the SS is able to better defend bubble to #3. Depending on game plan we can lock the DB's. 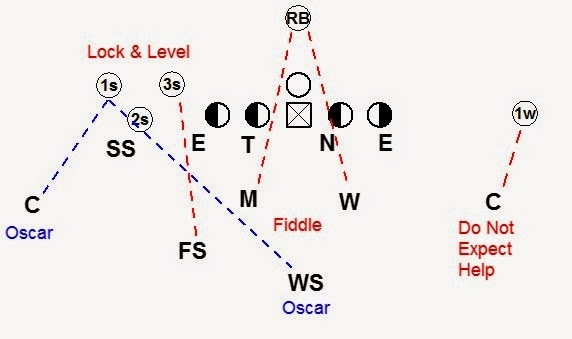 It is critical the DB's align at different depths (Levels) to prevent pick routes. Here the SS is playing aggressively on #2. The FS is aligned deeper. 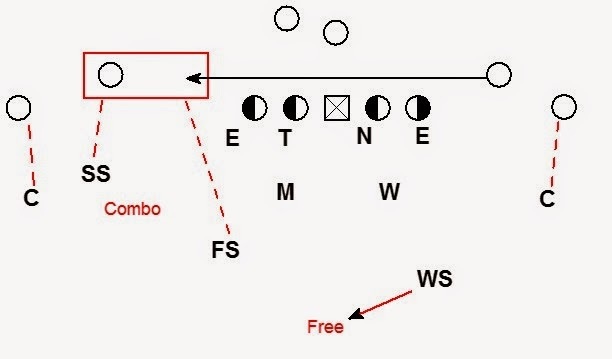 If we want the FS to play more aggressively vs. the #3 receiver the SS must play deeper to avoid being picked. 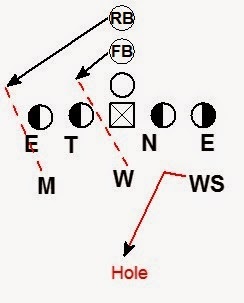 When #3 is a TE or an H back aligned on the hip there is no threat of bubble to #3. In this case we will lock the SS and FS. 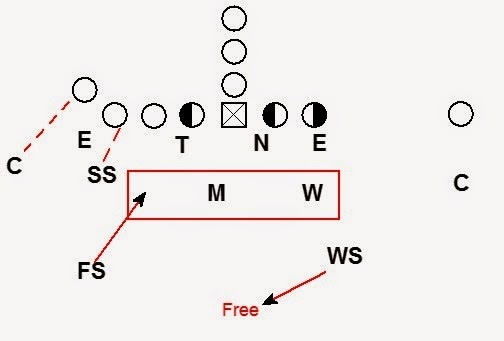 This allows the FS to aggressively play the run when the TE blocks. Against 3x1 into the boundary we can combo or lock & level. The SS will be the free player in this situation. Against spread teams that choose to use jet motion we use our funnel technique. 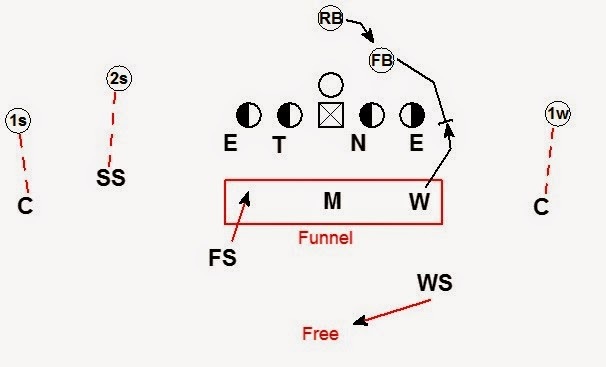 We play funnel technique and invert the FS against this look. The FS is able to take a good angle to leverage the jet sweep. Linebackers do not have time to bump opposite the funnel call in this situation. 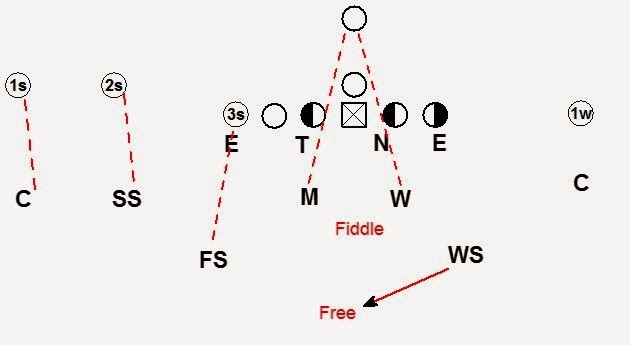 This is the same technique we use against teams the motion a WR to the backfield as a pitch player on option concepts. 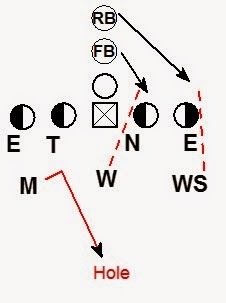 If the motion ends up crossing the formation the inverting safety can turn the call from a funnel to a combo. 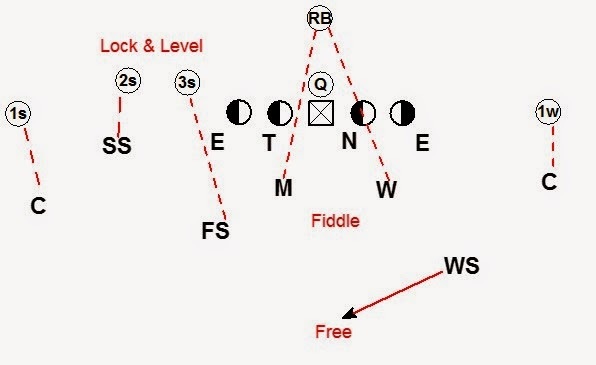 Against a bunch formation we again use the WS as the free player and play combo coverage. The SS plays outside leverage on the #2 receiver in the bunch and has #2 in press man. We align the SS outside to help the run support to the bunch. The FS and Corner combo cover the #1 and #3 in the bunch. By game plan we can lock and level the bunch formation. 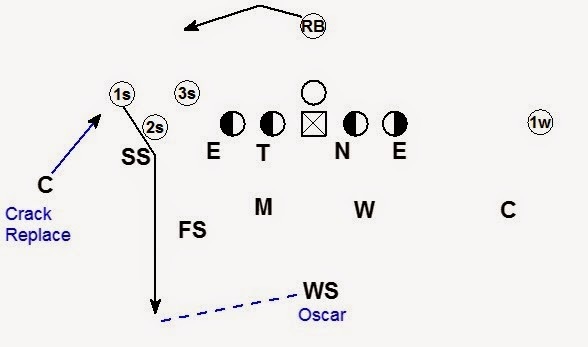 One reason we lock and level is to use our Oscar adjustment in cover 1. 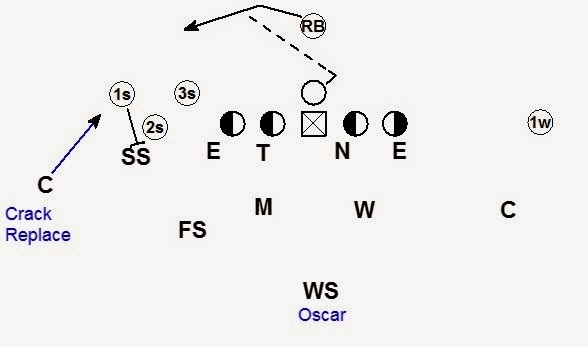 The Oscar call is a double on the outside receiver in the bunch by the corner and the free player. We use the Oscar adjustment to allow the corner to crack replace aggressively vs. crack toss. With the SS aligned outside leverage on #2 the corner should have a clear picture when #1 is crack blockings. The corner can be aggressive on the crack replace without worrying about the play action off the crack toss. 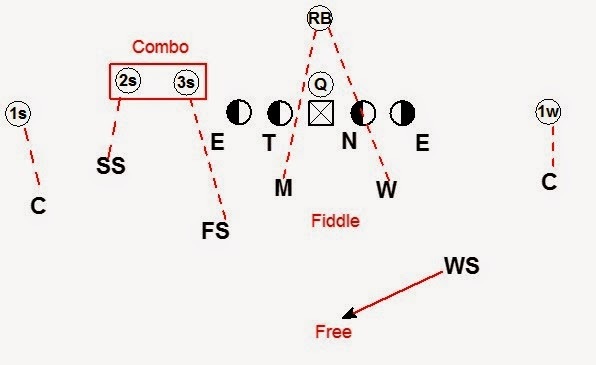 Those are the basic man matchups in cover 1. 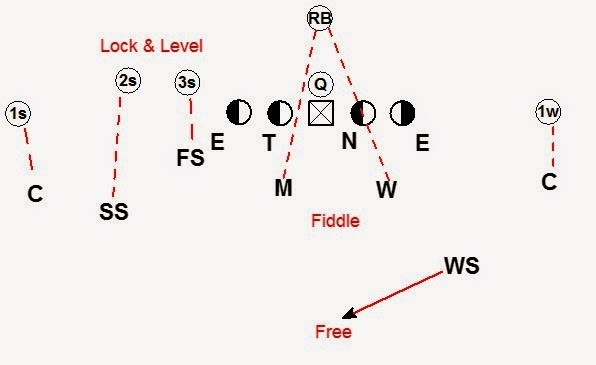 If there are other formations and motions you would like to see in a follow up post leave a comment or send an e-mail.